A festive, bubbly quilt of flowers and bright colors that will make your day! We are very excited to share this fun, gorgeous quilt pattern featuring “L’s Modern Fiesta Time” collection! Emily Breclaw is an author and a creative quilt designer with a large background in varying kinds of science. 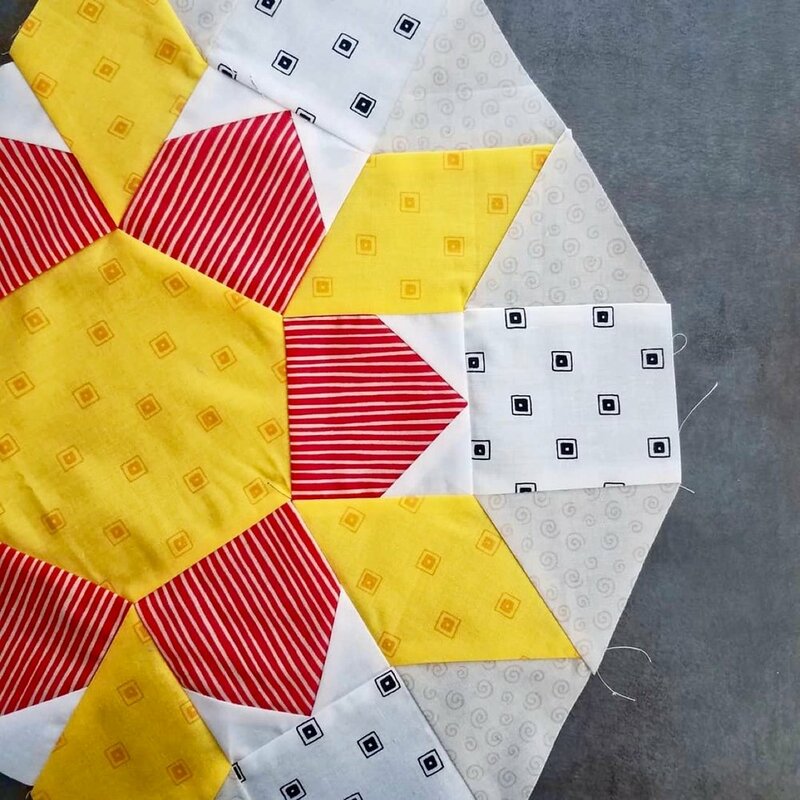 She started her pattern company, The Caffeinated Quilter, to help quilters expand their skills and discover the addicting fun of hexagon quilt patterns. Emily has created a masterpiece that we are delighted to be able to work with! Much appreciation to Emily for her work and smile. This new pattern is free, Pre-cut friendly and ready for you to start making! The “Fiesta Time Flowers” Quilt is a variation on the traditional Jack's chain design. Large patch sizes make this quilt easy to sew by machine, even if you're new to y- seams. The quilt can also be hand-pieced for a fun "on-the-go" project. Pattern includes coloring pages to audition your favorite color combinations, template pages for you to create your own templates (or you can purchase acrylics from Paper Pieces.com), and ample diagrams to help you sew hexagons like a pro. 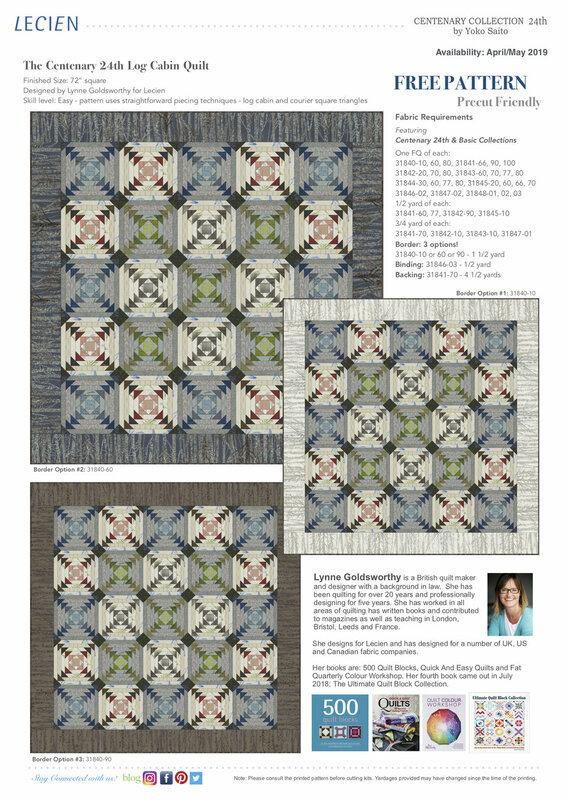 Emily's designs have been featured in Stitch, Quiltmaker and American Quilter. She published her first book, Adventures in Hexagons, with C&T publishing in 2017. You can follow along with her quilting adventures at thecaffeinatedquilter.com. Stay tuned for Emily’s announcement for the Quilt-A-longs as you get to have a fun time making this quilt and L’s Modern “Fiesta Time!” We know that these colors will make you smile! If you are looking for L’s Modern - Fiesta Time! collection, please search online with keywords “LECIEN L’s Modern Fiesta Time”. Thank you! FREE Pattern - New "Centenary 23rd Collection by Yoko Saito"
"Centenary Stars Quilt" designed by Lynne Goldsworthy using "Centenary 23rd Collection by Yoko Saito"
We are very excited to share this beautiful FREE Exclusive pattern that uses the latest Centenary Collection by Yoko Saito. Each year the Centenary Collection releases both prints and yarn dyed fabrics, and this year marks the 23rd anniversary - once again in all beautiful Ms. Saito's ingenious taupe colors! 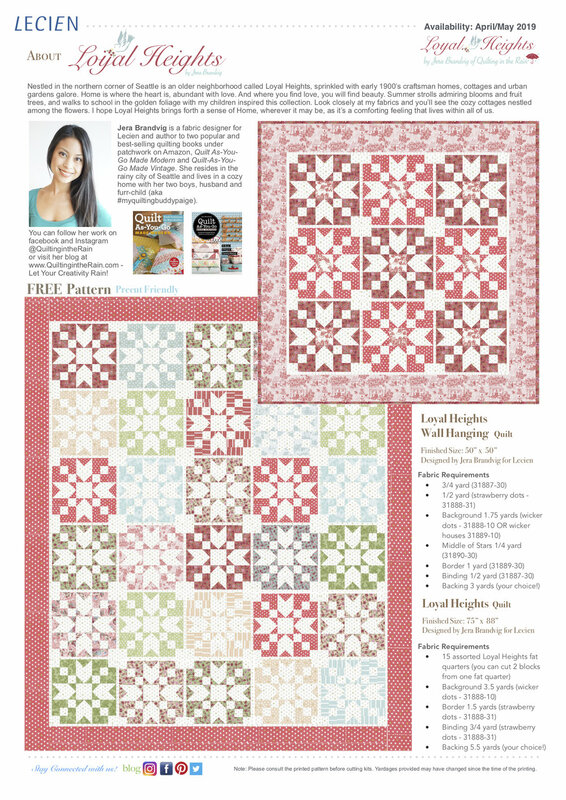 This FREE pattern "Centenary Stars Quilt" (size:62" x 82") is designed by Lynne Goldsworthy and is a precut friendly using 3 different color assortments of Origami Squares (10" squares) with our solid Snow White in background. Thank you so much Lynne for creating a gorgeous pattern! You can download the pattern and print out, give away, or make quilt kits using "Centenary 23rd Collection". We hope you enjoy making this beautiful quilt with Centenary Collection! We are so excited to share this amazing news with you - but there is so much to tell you, so we hope you can relax and read this blog with a cup of tea! 1. Ms. Yoko Saito is Coming! A prominent and celebrated quit artist and designer Ms. Yoko Saito is coming to the U.S. to attend the Quilt Market & Quilt Festival in Houston, TX from October 26 to November 5! We are super excited to welcome Ms. Saito!! She has not been to these events in many years, so we hope you have a chance to meet her in person, to see her special exhibition, and possibly to attend the "Reception Party with Yoko Saito" an exclusive invitation only party to the shop owners (see the details below). Ms. Yoko Saito posing in front of her "Around the World" quilt, over 20,000 pcs of 1 cm squares all pieced by hand. Photo taken at Quilt Party, Ms. Saito's quilt shop and school in Ichikawa City in Chiba, Japan in 2016. Don't miss this rare opportunity to view a curated collection of more than 30 quilts and hand bags made by Ms. Yoko Saito from 1978 to 2015 in Houston at Quilt Market & Quilt Festival this year, “Yoko Saito Through the Years – My Quilt Journey" sponsored by Quilt Party Co. Ltd, Lecien Corporation, Clover Japan Corporation, and Stitch Publications / Martingale - More than 30 quilts and other projects here showcase Saito’s delicate sense of intricate handwork, the evolution of her use and choice of color over the years, and designs that have inspired her. This includes the warmth and beauty of her handwork. 10/26-10/30, 11/2-11/5 says Quilts Inc. Please share this special news with your friends!! Yoko Saito is known for her ingenious use of “taupe color”, the concept of using delicate and gentle taupe colors in many quilting and other sewing projects for the last 20 years. Ms. Saito has written a book titled "Yoko Saito’s Japanese Taupe Color Theory - A Study Guide”. The book teaches the simplicity and complexity of a Japanese taupe color palette, and how you can use the taupe colors in your own projects. Each year the Centenary Collection releases both prints and yarn dyed fabrics. We are very excited to be releasing our 23rd collection by Yoko Saito this year. Centenary 23rd Collection - Prints 26 SKUs, Basic 22 SKUs, and Yarn Dyed 13 SKUs. 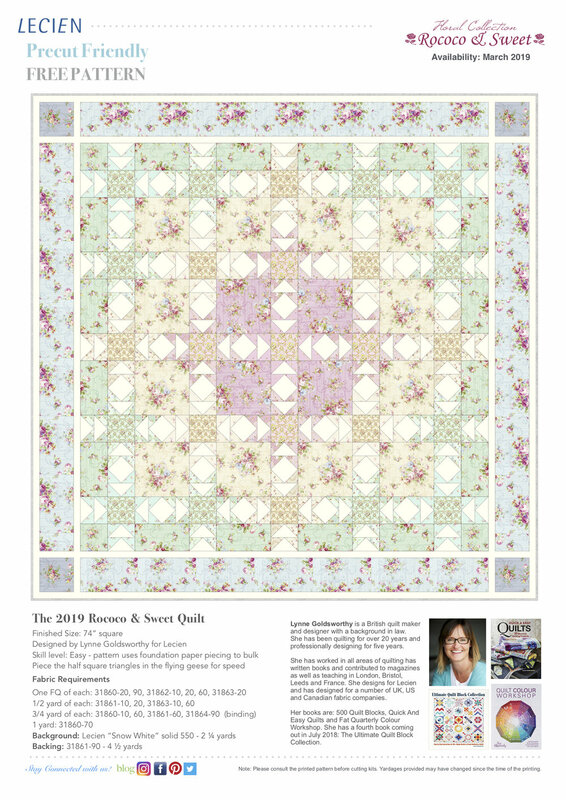 We will have many precuts available as well as "Special Sampler Kit" designed by Yoko Saito, plus our FREE "Centenary Stars Quilt" pattern by Lynne Goldsworthy. More fabric images, a FREE Pattern, and product information will be on the next blog post, so stay tuned! Special Sampler Kit designed by Yoko Saito - Inspired by the book, "Yoko Saito's Traditional Block Patterns" by Stitch Publications, we have created a kit containing 9 blocks to make a beautiful throw quilt. This pattern is for beginner to Intermediate levels and put together to enjoy Yoko Saito's taupe colors. Kit includes fabrics for the quilt top, Lecien COSMO new sewing thread "Tsumugi" spool, and Lecien COSMO floss (3 skeins), Centenary Collection information and Pattern/Instructions. 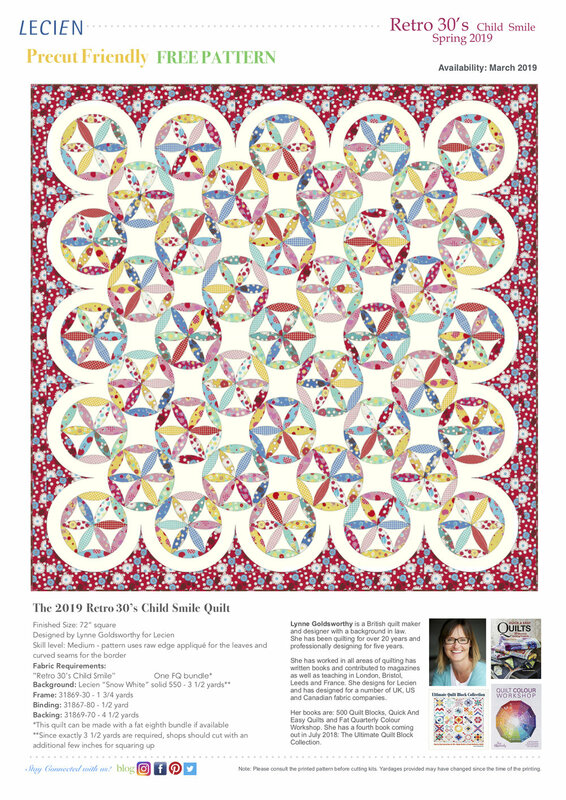 FREE Pattern "Centenary Stars Quilt" designed by Lynne Goldsworthy for Lecien. Details of pattern information will be coming in the next blog post, so stay tuned. So many wonderful Yoko Saito books are available in English! We would like everyone to have a chance to take these books in their hand and flip though all the pages to see these amazing projects using her beautiful Japanese taupe color palettes. Above three Yoko Saito's Books are part of the Special Campaign - please contact our distributors Checker or EE Schenck for more details. Also find many more wonderful Yoko Saito's titles at Martingale. 4. Special Pre-Order Campaign for Shops! If you buy more than $1,500 value from any of the items on the *menu, you will receive one ticket (admit 2) to attend *“the Special Reception Party with Yoko Saito” to meet Yoko Saito and have a fun time. Reception is scheduled at Embassy Suites by Hilton Hotel on Saturday, 10/28. Both the tickets and the special limited time discounted case packs will be offered with limited quantity - 25 Tickets (2 people can attend per 1 ticket) per distributor will be available on a first-come, first-serve basis. Even if you don’t go to the Quilt Market, you will still receive the special limited time discount purchasing during the campaign sales period. *Please contact Checker or EE Schenck right away for details to get these special reception party tickets that will be available only to shop owners. In addition to her Special Exhibition, we are planning the following events! Collaboration at Quilt Market - Lecien (Booth #2234) and Stitch Publications / Martingale (Booth #2226) will have booths across from each other, and Yoko Saito’s quilts, projects, and fabrics and books will be on display. Ms. Yoko Saito will also be demonstrating her handwork at various times at our booths. Please come visit our booths to meet her in person! Joint Schoolhouse Classes - Lecien and Stitch Publications/Martingale invites Ms. Yoko Saito as a schoolhouse teacher and offers two-30 minutes classes; The first class will focus on Yoko Saito’s books and some of her projects within these books. The second class will focus on the Centenary Collection’s history, fabric design process, and the concept of Japanese Taupes. We would like to thank Ms. Priscilla Knoble of Stitch Publications. She will be translating all the schoolhouse classes in addition to the workshop, book signing, and other events during the market and festival time. Her truly remarkable translation work for all Ms. Saito's titles made so many quilters dreams come true. We are so fortunate to collaborate with her for many events this year. Thank you! We will have a special giveaway bag for everyone who attends the schoolhouse - including the Centenary fabric, sewing thread, floss, and more to surprise you! The Schoolhouse class schedule hasn't been announced yet, but as soon as we know, we will inform you! Book Signing - There will be several book signing opportunities. It will kick off on the first day of the market in the Lecien booth, and Checker, and EE Schenck booths to follow, the details will be announced later. We like to thank Martingale for their very generous offer to giveaway Yoko Saito's books for book signing! *Special Reception Party with Yoko Saito – We will be inviting over only the first 50 shops who are among those who purchase the special case pack by Lecien and books by Stitch/Martingale during the pre-order campaign starting on on Friday September 15 at 9:00am (PST)/12:00pm (EST) to meet Yoko Saito and have a fun time. Reception is scheduled at Embassy Suites by Hilton Hotel on 10/28. *Please contact Checker or EE Schenck right away for details to get these first-come, first-serve special reception party tickets that will be available only to shop owners. Workshop - Yoko Saito will be teaching a workshop during the Quilt Festival. This class unfortunately already sold out. That's all for now and we hope to see you at the market or the festival!